I repeat myself: this is one of my favorite sweaters to knit. It's thick and squooshy. The yarn is very soft acrylic to make it an easy-to-care-for sweater. The turquoise blue color gives this sweater a vibrant look. The color is very eye-catching. It would look great with lots of different colors. 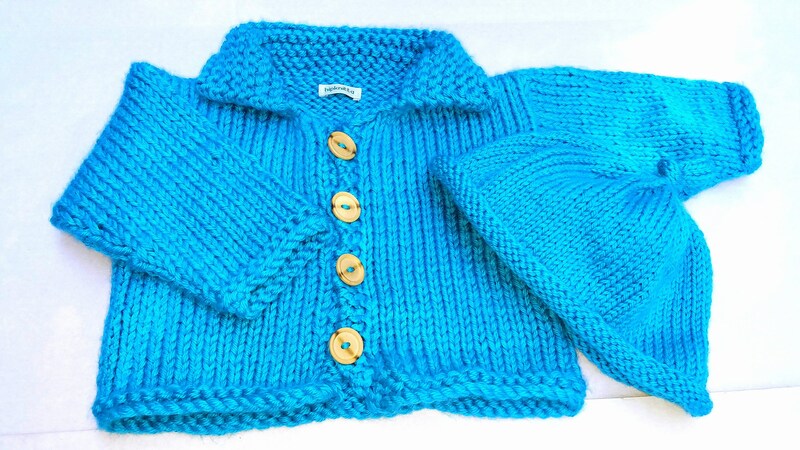 The wooden buttons give this sweater an organic feel. They slip through the button band wherever you want to button the sweater. There aren't any defined buttonholes. The hat has a rolled brim which allows it to stretch gently over the baby's head. It is knitted in one strand of the yarn and matches the sweater perfectly. It is a cute set and will look absolutely adorable on the baby! The set can fit a baby up to 12 months old or more depending on the size of your baby. Bring home the baby in this set and watch the little one grow into it. This sweater/hat set, when purchased, will be wrapped in tissue paper in a box.